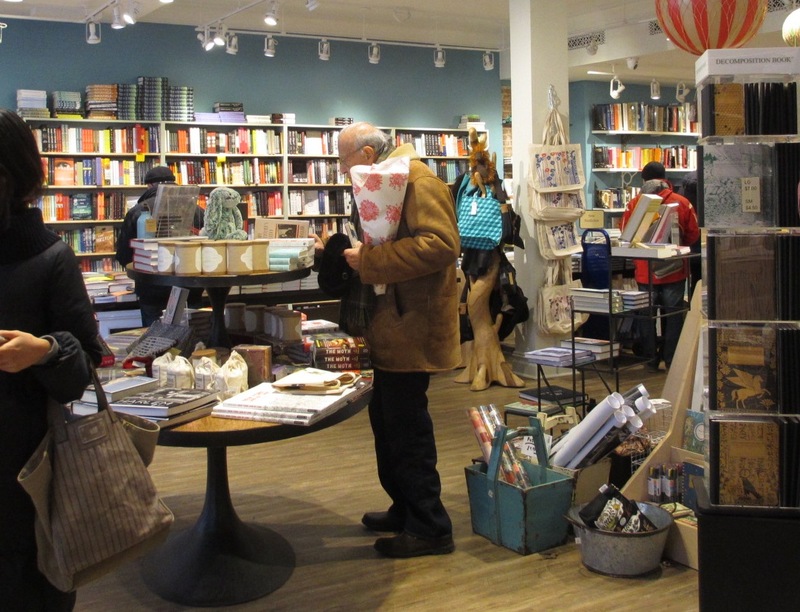 Amazon isn't the only online bookseller to open a bricks-and-mortar bookstore/showroom recently. Last month, online travel bookstore Longitude Books opened a physical bookstore/showroom in its office space in Plymouth, Minn. The physical store, which showcases in particular coffee-table books, paper maps and other items, is adjacent to the company's 10,000 square-foot-warehouse containing some 7,000 books and 10,000 maps. 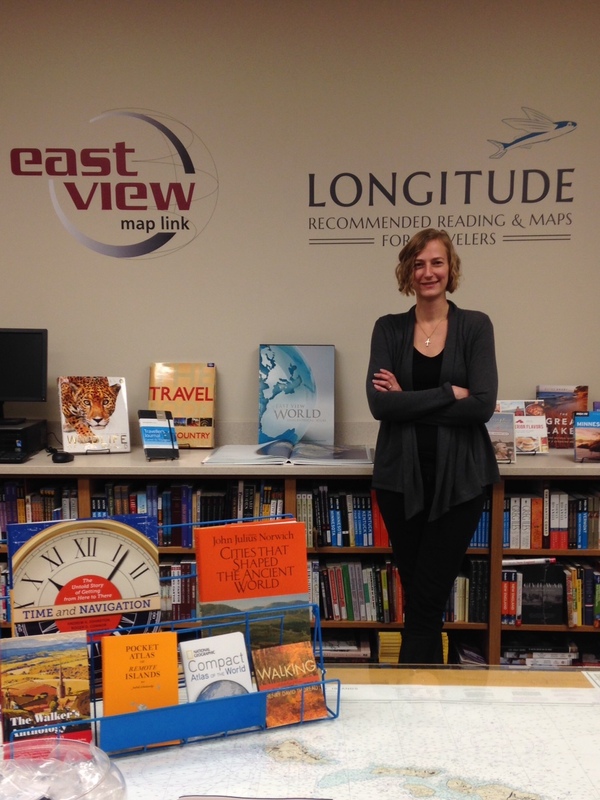 "The showroom allows us to reach local, independent travelers, and it allows them to see and handle books and maps before they buy," said Jodie Vinson, Longitude's managing editor. For most of its existence, the store's business model has focused on creating lists of fiction and nonfiction books in partnership with tour operators and travel planners, but Longitude Books will also sell books to any traveler. "Our business revolves around place--it's about understanding what makes a destination unique, so it made sense to create a physical space for our books and maps--to turn ourselves into a destination." The showroom does not have any bookstore-only staff, but between the staff members from both Longitude Books and East View Map Link, which bought Longitude Books in 2012, there are 11 people on-site. And though books are showcased primarily in Longitude's office spaces, the staff is happy to give visitors tours of the warehouse. Village Books & Paper Dreams, Bellingham, Wash., has scheduled a soft opening of its second location, in Lynden, for next Friday, Bookselling This Week reported. "We hope we're ready for November 20," said co-owner Chuck Robinson. "It's going to require quite a few things to dovetail for it all to come together. Our leadership team has just been working really, really hard. There's just so much that has to wait until the last minute." Workers are currently putting the finishing touches on the historic Waples Mercantile Building, which will also house a new 35-room inn; an Avenue Bread café; a taproom; and the Drizzle Olive Oil and Vinegar Tasting Room, BTW noted. 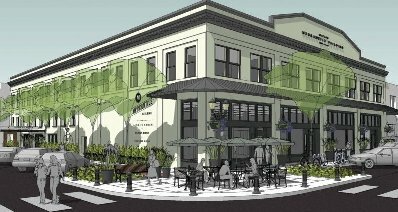 Robinson said he will be joining with the building's other occupants to host a grand opening celebration in January, once all the storefronts have opened. "We've had articles [about the new store] in each of the last issues of our Chuckanut Reader," he said. "We also have signs up in the [Bellingham] bookstore, and we've been selling discounted gift cards that are usable at the second store only.... We've heard from many people who are saying they really can't wait for our store in Lynden to open." Penguin Random House has launched the 2015 edition of its #GiveaBook campaign, a social-media based initiative to promote books as gifts and give back to children in need during the holiday season. For every use of the hashtag #GiveaBook on Facebook and Twitter between November 16 and December 24, PRH will donate one book to the literacy charity First Book (up to 35,000 times). In 2014, the debut campaign surpassed its initial goal of 25,000 #GiveaBook posts, which led the publisher to increase its commitment. New this year is the Giving Map, though which online visitors can discover ways in which they can participate by displaying all related #GiveaBook activities in their areas. PRH noted that booksellers are encouraged to enter information about their stores' holiday book drives, collection details and other giving activities on the Giving Map submission form. Amazon "is in advanced negotiations" to lease office space in the Franklin, a two-tower property in downtown Chicago, Crain's reported, adding that the online retailer is believed to be seeking about 30,000 square feet in the Franklin's taller, 60-story structure at 227 W. Monroe St. Earlier this year, Amazon signed its first two leases in Chicago for smaller warehouses "to get closer to urban customers" for Prime Now deliveries, and announced plans to open a nearly 500,000-square-foot fulfillment center in Joliet. André Glucksmann, "one of the most prominent of the French 'New Philosophers,' a group of former radicals who broke with Marxism in the 1970s and became an intellectual counterweight to France's political left," died Tuesday, the New York Times reported. His books include The Cook & the Cannibal and The Master Thinkers. Paul Hogan, "a longtime manager at Robin's Books, Philadelphia's oldest independent bookseller," died Wednesday, the Inquirer reported. He was 77. Until the bookstore closed at the end of 2012, "Hogan was well-known to book lovers who flocked to Robin's not only for books but also to experience the place as a community center, counterculture magnet, and performance space for artists, poets, musicians, and teachers--many of them iconoclasts." Three Tor debut authors--Ilana C. Myer (Last Song Before Night), Fran Wilde (Updraft) and Seth Dickinson (The Traitor Baru Cormorant)--toured together through New England recently. Myer wrote: "The indie bookstores we visited on tour radiate this love of books: At Wellesley Books in Massachusetts and the Northshire Bookstores in Saratoga Springs, N.Y., and Manchester, Vt., the staff have written loving testimonies to their favorite books, lending a personal touch to the displays. The Northshire Bookstore in Vermont has been in business for 40 years; I spoke to a woman whose mother used to take her there when she was a child, and to this day, she loves to read. These bookstores do more than sell merchandise--they open doors for us into worlds. They become a cherished part of our history and what has made us who we are." Pictured: Wilde (l.) and Myer at Northshire Bookstore. Main Street Books, Mansfield, Ohio, was featured in a PBS story on WOSU's Broad & High show in a segment called "Destination Mansfield," a piece about the revival of the city's downtown. The first example in the program of Mansfield's "community of dedicated individuals who are determined to bring cultural vibrancy back to downtown Mansfield" is Main Street Books manager Llalan Fowler. She grew up in Mansfield, went away to school, then lived in Washington, D.C., Boston, Mass., and New York City before returning to Mansfield, where, with low expectations, she found other like-minded natives who had returned to Mansfield after periods away and wanted to rebuild downtown. Included in what she "wanted and expected in a community" were readings, writing groups, author visits, poetry readings and open mics "so I just scheduled [them] and told people to come and they did. It was great." Barnes & Noble chairman Leonard Riggio, who "has been a relatively low-key presence in recent years," created the chain bookseller's upcoming holiday TV commercial, featuring Tony Bennett and Lady Gaga, that will debut Monday during the national morning talk shows, the Wall Street Journal reported. In addition to conceiving and writing the spot, Riggio recruited the talent, asking longtime friend Bennett if he would participate and "if he could bring in Lady Gaga," with whom the legendary singer recorded the 2014 hit album, Cheek to Cheek. In the commercial, the duo "separately walk the aisles of a fictitious Barnes & Noble store while looking for a gift for each other. As they browse, viewers hear them singing 'Baby, It's Cold Outside.' " Eventually they meet, exchange gifts, and "before the commercial ends, viewers hear the tagline Barnes & Noble is hoping will strike a chord with book buyers: You never know who you’ll meet at Barnes & Noble," the Journal wrote. "I'd been thinking about physical books, digital books, future store concepts, and the essence of what is it about us that makes us who we are," said Riggio. "The idea of the meeting place, the piazza, is so much of what we've become across the country." They're facing less and less competition from national big-box bookstores, like Borders and Barnes & Noble. They're testing out new markets with pop-up shops and off-site operations. They appeal to New Yorkers who increasingly want to shop local. They select books based both on data and intuition. They're selling items and promoting perks other than books. "If [Amazon, with its new bricks and mortar store] want to compete with the smart, personalized service that indie bookstores and our amazing employees can provide, good luck to them!" said WORD Bookstores owner Christine Onorati. "I'm up for the challenge." Chris Doeblin, owner of Book Culture, observed: "With Borders gone, Barnes & Noble failing, its viable for more and more bookstores to be opening, because people are still reading. Its still a vibrant part of people's lives and I think there's an under availability of books in lots of places, certainly in New York City." Greenlight Bookstore co-owner Rebecca Fitting said, "There's definitely been a trend back towards shopping small. That kind of thing cycles around over the years: you expand big and then people miss shopping local." The newly launched Litographs Book Club "taps into a community of people whose jobs are to help others discover and experience the books they love--independent booksellers. Every season, we ask four different booksellers: 'If you could recommend one book, what would it be?' We take their suggestions, create a digital home for each title, and make it easy for readers to find and read these books with each other." Noting that bookstores "have long known that recommending books is a craft, and it's one they've perfected over the course of helping millions find their next great book," Litographs is currently partnering with the Harvard Book Store, Cambridge, Mass., Green Apple Books in San Francisco, Calif., Elliott Bay Book Company in Seattle, Wash., and Left Bank Books in St. Louis, Mo. "While reading is often a solitary experience, the love of books is not. 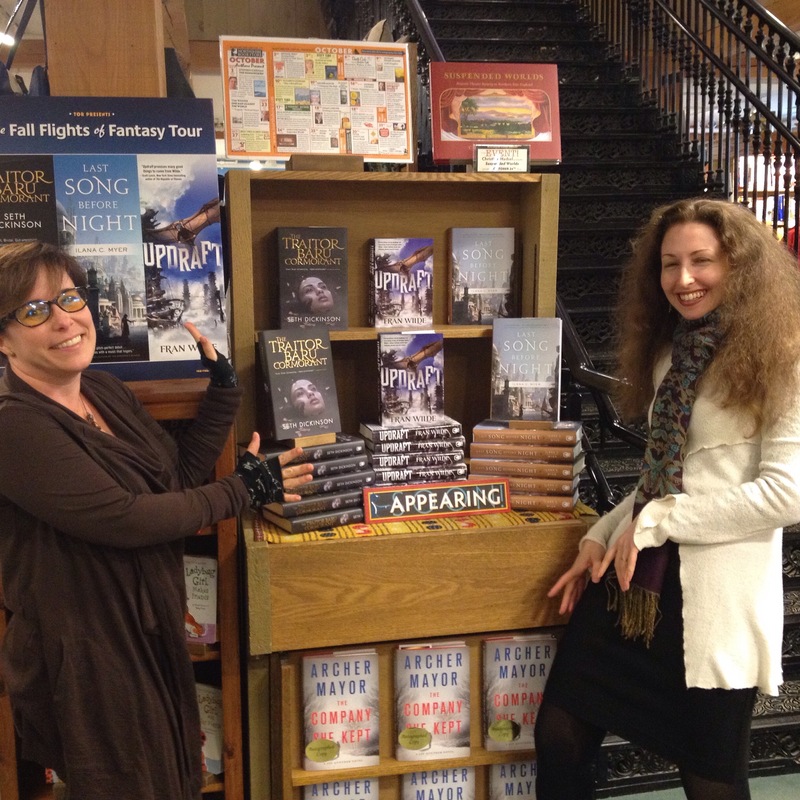 Bookstores are about conversation--among readers and between writers and the reading public. We love the fact that Litographs is seeking to bring that experience online," said Harvard Book Store owner Jeff Mayersohn. Great Soul of Siberia: Passion, Obsession, and One Man's Quest for the World's Most Elusive Tiger (Greystone Books) by Sooyong Park, a Korean filmmaker and researcher who has spent 20 years studying and protecting wild Siberian Tigers. The View: Betty Boyd Caroli, author of Lady Bird and Lyndon: The Hidden Story of a Marriage that Made a President (Simon & Schuster, $29.99, 9781439191224). Weekend Edition: Magnus Nilsson, author of The Nordic Cookbook (Phaidon Press, $49.95, 9780714868721). OWN's Super Soul Sunday: Shonda Rhimes, author of Year of Yes: How to Dance It Out, Stand in the Sun and Be Your Own Person (Simon & Schuster, $24.99, 9781476777092). Broad Green optioned Julie Klausner's memoir I Don't Care About Your Band and has attached the author to co-write the script. Deadline.com reported that "the possibility remains open" for Klausner, who created, wrote and starred in the Hulu series Difficult People, to star in the project, though "nothing has yet been decided on that front." Amy Pascal's Pascal Pictures "won a bidding battle" for Crash Override: How to Save the Internet from Itself, an upcoming memoir by game designer Zoe Quinn (Touchstone, September 2016) that "was bid on by several studios and TV outlets, and several actresses are circling, with interest from Scarlett Johansson said to be keenest," Deadline.com reported. Rebecca Angelo and Lauren Schuker Blum are set to adapt. Burton Pike has won the $5,000 Friedrich Ulfers Prize, awarded annually by Deutsches Haus at New York University and endowed by Professor Friedrich Ulfers. Honoring "a publisher, writer, critic, translator, or scholar who has championed the advancement of German-language literature in the United States," the prize will be presented to Pike at the opening ceremony of New York City's Festival Neue Literatur on February 25, 2016. Pike is Professor Emeritus of Comparative Literature and German at the Graduate Center of the City University of New York and has written extensively on Robert Musil, has edited and co-translated Musil's The Man Without Qualities (finalist and Special Citation, PEN Translation Prize) and a book of Musil's essays, Precision and Soul, as well as edited a collection of Musil's stories. He has also translated and written the introductions to Goethe's novel The Sorrows of Young Werther, Rilke's The Notebooks of Malte Laurids Brigge and Gerhard Meier's Isle of the Dead, which won the 2012 Helen and Kurt Wolff Prize for the best translation of a literary work from German. He translated a story by Proust for Conjunctions, a story by Ingeborg Bachmann for Grand Street and stories by Alissa Walser for Chicago Review and Painting in a Man's World. His translations of prose and poetry from German and French have appeared in Fiction, Grand Street, Conjunctions and other magazines. B.A. Shapiro is the author of the novels The Art Forger, The Safe Room, Blind Spot, See No Evil, Blameless and Shattered Echoes. She has also written screenplays and the nonfiction book The Big Squeeze. The Art Forger won many awards, including the 2013 New England Book Award for Fiction. 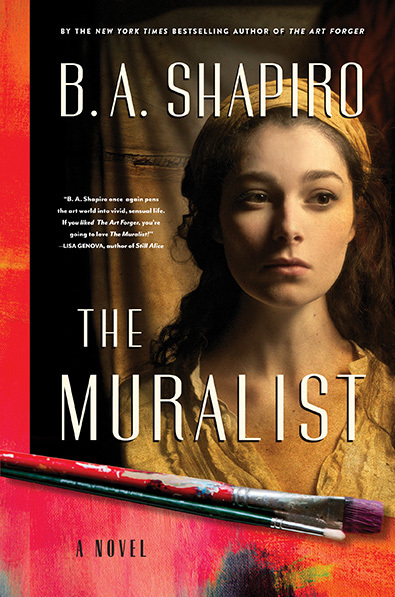 Her new novel, The Muralist, was just published by Algonquin. Drown by Junot Díaz (I just finished This Is How You Lose Her and loved it). Ripley Under Ground by Patricia Highsmith (I just finished The Talented Mr. Ripley and loved it). This Is Your Life, Harriet Chance! by Jonathan Evison (I'm doing an event with him and like to have read my co-panelist's work). A Wrinkle in Time by Madeleine L'Engle. I must have read it a half dozen times. I just loved how it took me to so many different worlds without my having to leave my bedroom. This was the first book that gave me a real understanding of the power of the novel. I don't really have favorite authors as much as I have favorite books: Middlesex by Jeffrey Eugenides, The Poisonwood Bible by Barbara Kingsolver, Their Eyes Were Watching God by Zora Neale Hurston, The Accidental Tourist by Anne Tyler, The Things They Carried by Tim O'Brien and so, so, so many others. I wasn't an English major--I have three degrees in sociology--so I never have to fake it. No one expects a sociologist to have read Ulysses. Olive Kitteridge by Elizabeth Strout. I am so impressed with her use of short stories from a multitude of characters' viewpoints to build a multi-multi-dimensional Olive. A masterpiece. Bill Roorbach's The Remedy for Love. The icy blue draws you into the flame at the center and impels you to pick up the book. The Group by Mary McCarthy. Although it was actually their book, I hid the fact I was reading it. They didn't believe I was old enough, but of course I was. I know this isn't politically correct, but it was Gone with the Wind by Margaret Mitchell. I read it when I was about 12--and didn't know it was politically incorrect--and after turning the last page, I went back to page one and read it again. I decided then that I wanted to be a novelist--or Scarlett O'Hara. Being a novelist worked out better. The Muralist, my 11th novel--the seventh published--is my favorite. It's a kind of genre-breaker, a historical fiction with art, a mysterious disappearance, characters interacting with historic personages and a message about the evil of bigotry that's as relevant to pre-World War II America as it is today. Foreign correspondent and Newsweek contributing editor Alex Perry (Lifeblood) takes an ambitious and controversial approach to answering some of the thorniest questions about Africa's contradictions and its epic quest for freedom. 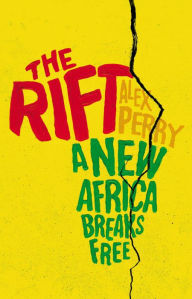 Perry starts from the premise that "outsiders" all too often get Africa wrong. The journalists, academics and foreign aid workers who define Africa for the Western world tend to treat Africa as a monolithic entity or sell their own solution. Well-intentioned aid often infantilizes and humiliates. Aware he's an outsider, Perry avoids interviewing familiar experts in favor of recounting the stories he's been told over the course of a decade crisscrossing the continent. He writes about men and women from Kenya, South Sudan, Rwanda, South Africa and elsewhere, individuals whose daily struggles in the face of unimaginable hardship reveal commonalities and say something meaningful about the Western response to Africans and Africa in general. There's Khalima, the 38-year-old mother of nine in Mogadishu, husband near death, her five remaining children left at the city gates while she searches for a burial site for her dying seven-year-old son. But the city is so devastated by famine and war that there is no more spare land for graves. The episode gives a human face to an avoidable disaster: southern Somalia was under the control of a militant group with terrorist ties, and a U.S. aid block, part of the U.S. war on terror, was intended to deprive a few thousand militia fighters, but effectively denied emergency food to several million Somalis, resulting in a humanitarian crisis. Perry does equal justice to other seemingly intractable problems, like extreme economic disparities, the unimaginable scale of the continent, the legacies of history--which include civilizations and cultures that Western explorers failed to recognize as advanced--and the ongoing consequences of slavery and colonialism. Yet, the continent has enormous potential: Africa's economic growth has been double the global average since 2003, and accounts for more than half the world's 10 fastest-growing economies. Today, 50% of Africans are destitute; by 2030, that number is expected to fall to 25%, a difference of a half a billion human beings. Perry is clear about both the profound humanitarian implications, and the painful and inevitable social and economic disruptions--the "rift" of the book's title. Shelf Talker: Drawing from over a decade of on-the-ground reporting, Rift is a powerful and unforgettable book about a dynamic continent and its people. As the holiday season approaches, I thought it might be an appropriate moment to showcase the Book Industry Charitable Foundation, which has been providing financial assistance to booksellers in need since 1996. 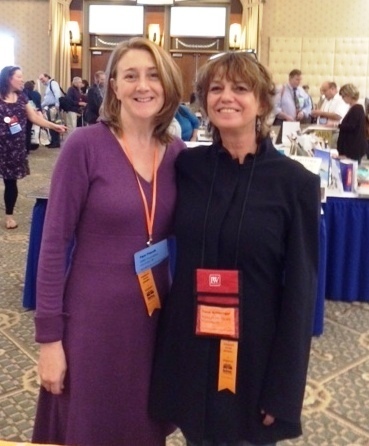 During the New England Independent Booksellers Association Fall Conference, I discussed Binc's ongoing role with executive director Pam French, and checked in with her again this week because the organization's major fundraising campaign kicks off December 1. "We are encouraging booksellers and others in the industry to see the foundation as their foundation, an example of book people helping each other," French said. "A donation to Binc will allow booksellers to take part in writing the next chapter on bookseller assistance (which also happens to be the theme of the annual campaign) and to continue providing bookseller assistance for years to come." As of November 9, Binc had distributed $50,331 to 26 booksellers and their families this year. It had received 35 requests overall year-to-date and is actively managing several of those not yet resolved. In 2014, Binc fielded on average one request per week. "We are still learning the cadence of requests," French noted. "There is typically an increase in requests after the fall trade shows, and after Winter Institute. It reinforces the importance of being present at those events and continually spreading awareness. We plan for grant requests to increase each year, but this year the number has not increased. In my ideal world that's because everyone who has a need has contacted us, but there remains an awareness gap. "One trend that does appear is that requests for major medical are consistent, but now are more complex and take longer to complete. For example, we have had several grant requests related to cancer treatment care. The requests can take months to manage since the treatments are longer and the bills higher." In 2015, Binc has also distributed $200,000 in higher education scholarships, a $2,000 matching grant to an indie bookstore and about $13,000 for the professional development scholarship initiative that provides booksellers financial assistance to attend industry events. Pam French (l.) at the NEIBA show with Binc fundraising committee member Susan Schlesinger of Books on the Square in Providence, R.I. 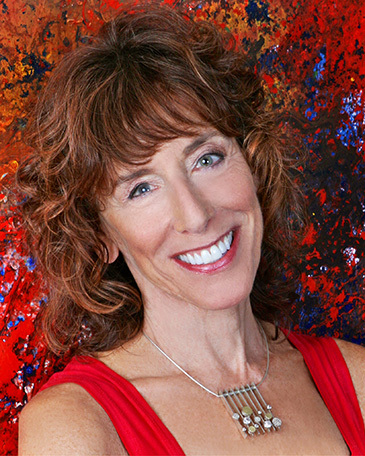 Since she became executive director of what was then the Borders Group Foundation in 2009, French has witnessed Binc's core mission evolve significantly "from an organization focused solely on one employee population, with direct communication channels, to a nationwide organization and a variety of ways to connect with booksellers. We initially focused on letting the trade associations and bookstore owners know about Binc and earning credibility. "Our original outreach was to the CEOs of the national trade associations. Oren Teicher and the ABA board have become some of our strongest allies/supporters. And once we learned about the regional trade associations, we contacted each executive director and introduced ourselves. The regional e.d. 's have helped us spread the word; they are truly great partners and have been invaluable in getting Binc off the ground. We cannot thank Oren, the ABA and each of the regional IBA e.d. 's enough." What does the future hold for Binc? "In 2011 we gave ourselves three years to determine if the foundation was useful and effective given the expanded mission of serving all bookstore employees," French recalled. "After a survey in 2013, increased grant requests in 2014 and input from key partners the board of directors determined that the foundation had met our original goals of earning credibility, creating awareness and meeting the needs of booksellers, and that we should work towards becoming sustainable." She noted that the foundation "is extremely fortunate to have had existing funds to use while we launched Binc nationwide, established industry partners and determined if a charity focused on helping booksellers was viable. Up until 2015, we had done some fundraising but it was not with the goal of becoming sustainable or on a broad scale. Once we determined that the foundation served a need within the industry, we also determined that we needed to raise funds to continue to help booksellers." Binc has made progress toward its fundraising goals in 2015, but still has a way to go to become sustainable. "Our learning curve has been steep since nationwide fundraising is new to Binc," French observed. "We are working to connect with publishers, bookstores and individuals throughout the industry as financial supporters." Since we are in the storytelling business, I asked her to share one recent experience that stood out as an example of the importance of Binc's mission. She recalled a grant recipient who'd been uncertain about qualifying for assistance. "I always encourage booksellers to contact us with questions," French noted. "Often their situation does qualify for a grant, or we can point them to other resources for assistance." Later, the bookseller shared this reaction: "At our regional trade show I attended the general membership meeting and heard from a rep of Binc. I hadn't suffered any of the major catastrophes that I thought were a necessary qualification for a Binc grant, but the presentation at the membership meeting made me realize that maybe I didn't need a major catastrophe, just a series of small ones. Within a week of initially contacting Binc I was informed that I would be receiving a grant sufficient to get me caught up on rent, which would allow me to also get caught up on utilities (and some of my lost sleep). They saved my life and my sanity at a time when I was feeling nothing but frustration bordering on despair."